Scholarly communication is the ​process of academics, scholars and researchers sharing and publishing their research findings so that they are available to the wider academic community and beyond. Traditionally scholarly communication has occurred in the formal literature - in journal articles, conference proceedings, book chapters and books. However as the image below demonstrates, the landscape is changing dramatically. These pages are designed to help researchers, librarians, administrators and other interested people find out more about this dynamic and interesting area. 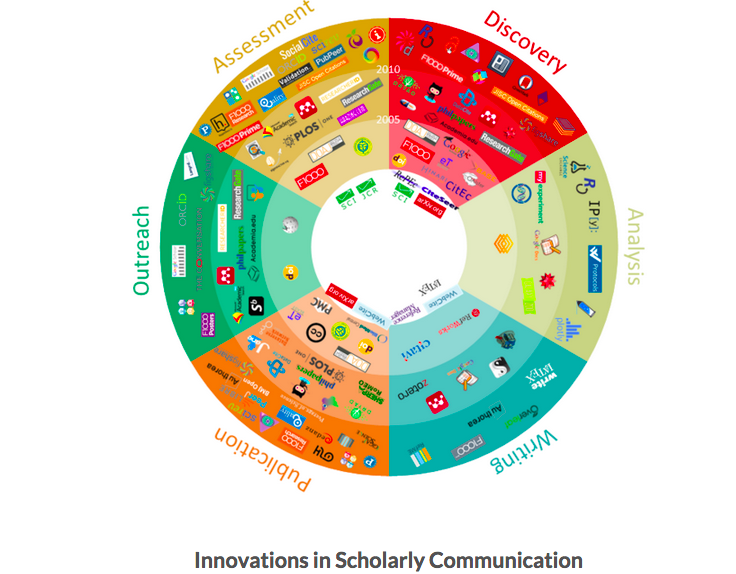 The image below comes from a program 'Innovations in Scholarly Communication' being run from the University of Utrecht which is aiming to chart innovations in scholarly communication and how these innovations change research workflows and may contribute to more open, efficient and good science. In 2015-6 they ran a survey about the changing landscape of scholarly communications. They have written a blog post about the survey, which contains links to the data.